Marilyn Anderson's latest publishing effort is the bilingual Spanish/ English book Guardianes de las artes: grabados de artistas y artesanos de Guatemala/ Guardians of the Arts: Prints of Guatemalan Artists and Artisans. Printed in Guatemala City, books were recently shipped to the United States and will be distributed and sold from this website and other sources. Please visit the Ordering page for more information on purchasing the book. 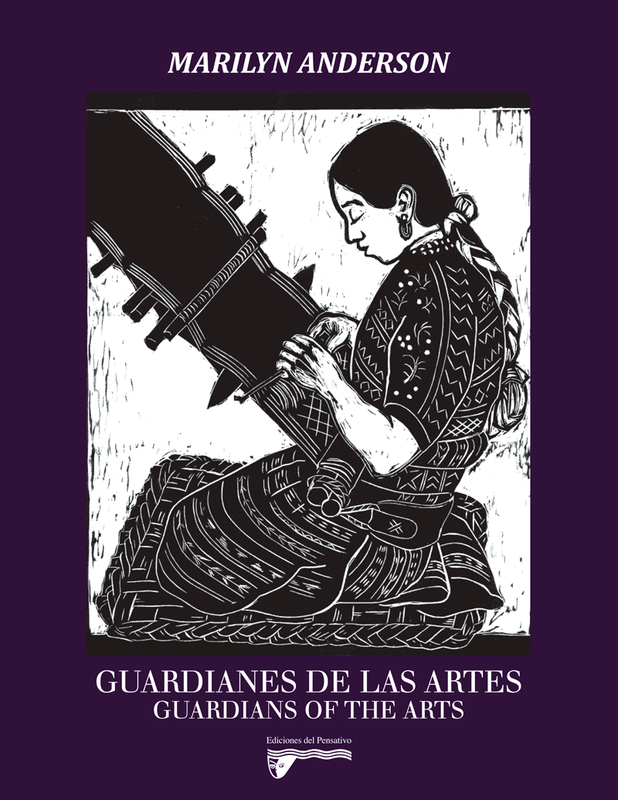 Guardianes de las artes: grabados de artistas y artesanos de Guatemala/ Guardians of the Arts: Prints of Guatemalan Artists and Artisans (2016, Ediciones del Pensativo, 142 pages). Guardianes de las artes /Guardians of the Arts is an art book, with a hard cover, printed on substantial natural beige colored stock. The book is 11 1/4" (height) by 8 3/4" (width). Reproductions measure 8 3/4" by 6 3/4" with some slight variations in size. This allows each print reproduction to be appreciated. Images in Guardianes de las artes /Guardians of the Arts celebrate Guatemalan arts and crafts traditions as well as the artisans themselves. The book contains reproductions of 43 wood and linoleum relief prints. There are drawings on 25 on the caption pages. Each print has an extended bilingual caption in Spanish and English which describes techniques, the various uses of the crafts along with their history and place in today’s world. Other books about Guatemalan arts and crafts often use photography. In Guardianes de las artes /Guardians of the Arts, the images are created using relief print techniques to depict the artists and artisans of each craft. "Ecology and Arts and Crafts,"
"To Treasure and Nurture: Guatemala’s Artists and Artisans." The final essay includes a call to appreciate "...the Guatemalan spirit of creative ingenuity and tradition which lives on in their craft making..."
For information on how to purchase the book from this website, please visit the Ordering page. Two of Marilyn's previous books were printed in the 1970s, BACKSTRAP WEAVING (1975) and GUATEMALAN TEXTILES TODAY (1979). A third, GRANDDAUGHTERS OF CORN (1988), is co-authored with Jon Garlock. Although out of print, they can generally be found used on various websites.